Size of this preview: 774 × 600 pixels. Other resolutions: 310 × 240 pixels | 3,000 × 2,325 pixels. Description: U.S. Army soldiers on Bougainville (one of the Solomon Islands) in World War II. Japanese forces tried infiltrating the U.S. lines at night; at dawn, the U.S. soldiers would clear them out. 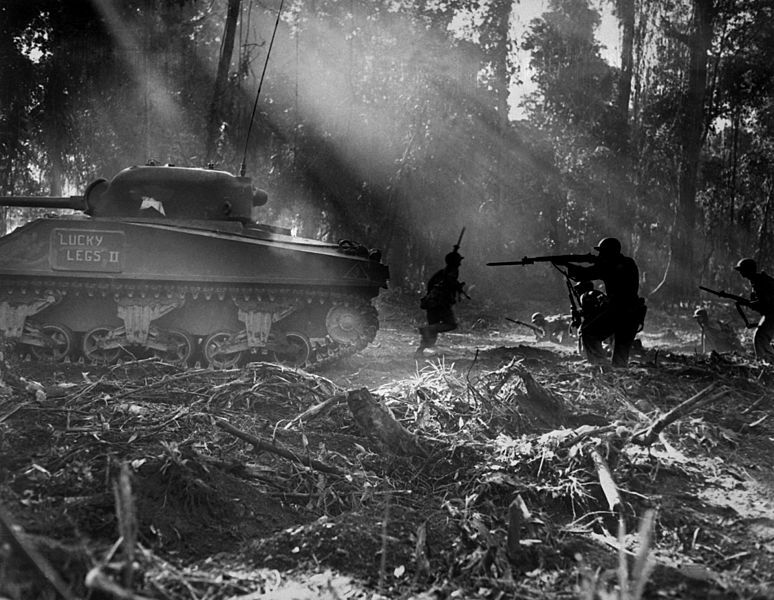 In this picture, infantrymen are advancing in the cover of an M4 Sherman tank. Credit: This media is available in the holdings of the National Archives and Records Administration, cataloged under the National Archives Identifier (NAID) 531183. This tag does not indicate the copyright status of the attached work. A normal copyright tag is still required. See Commons:Licensing for more information. English | Español | Français | Italiano | Македонски | മലയാളം | Nederlands | Polski | Português | Русский | Slovenščina | Türkçe | Українська | Tiếng Việt | 中文（简体） | 中文（繁體） | +/− This version downloaded from U.S. Department of Defense, Defense Visual Information Center (DVIC). Image ID HD-SN-99-02844.